Have you ever been diagnosed with chronic migraine headaches? Have your migraine headaches progressed to a point where you are having little response to medications? Is your headache bad enough that it is affecting your quality of life and ability to work? 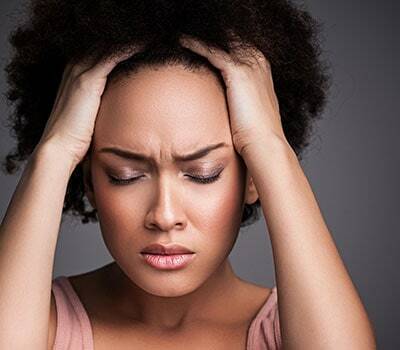 There is strong evidence that certain patients who have been diagnosed with moderate to severe migraine or chronic migraine actually have nerve compression headaches. The trigeminal and occipital nerves and their branches provide sensation to our face and scalp. As these nerves emerge from the brain and upper spine towards the skin, they pass through muscles and fibrous bands. In certain individuals with hyperactive and tense muscles, these nerves are compressed, which results in inflammation and irritation of the nerve branches. This, in return, causes tenderness and pain. Several nerve compression points have been identified and studied extensively. There are four common compression sites, also known as trigger points. The most common site is in the forehead, where there are two branches on each side that pass through the frown muscles. Removing the frown muscles relieves the nerve compression and deactivates the trigger site. These are the same muscles removed during cosmetic forehead or brow lift. This was the first migraine trigger site identified when women who had forehead lift surgery revealed that their headache was essentially eliminated. The other trigger points are located in the temple, inside the nose and on the back of the head on both sides. The nerve that gets compressed in the temple is called the zygomaticotemporal nerve. It provides sensation to that area. Treatment of this compression point is by surgical removal of the nerve. The trigger points inside the nose result in pain behind the eyes. There are nerve endings inside the nasal septum, which is the partition that separates both nostrils, and inside the turbinates, which are projections inside the nose. When the septum is deviated and the turbinates are enlarged, their surfaces touch and create contact points. It is believed that these contact points irritate the nerve endings and can trigger pain. The nasal trigger is deactivated by correcting the septal deviation and by reducing the size of the turbinates. The fourth most common site of nerve compression is the back of the head, where there are three nerves that can be responsible for migraine headaches. Of the three, the nerve most commonly associated with migraines is the greater occipital nerve. Compression of the nerve results in tightness or squeezing pain. Patients are usually able to localize tender points on either side of the back of the head. Treatment of this compression point is carried out by removing a small portion of the muscle around the nerve and releasing fibrous bands compressing the nerve. All surgeries are performed through small incisions with a minimally invasive approach. The forehead and temple nerve compression points are deactivated through small incisions, half an inch each behind the hairline. Endoscopic instruments are used with the aid of a camera to identify the nerves and release the pressure points. The forehead nerves can also be accessed through an upper eyelid incision, the same one used for blepharoplasty. The nerves on the back of the head are exposed through an incision, one and a half inches long, in the middle of the scalp, right above the neck. Correction of the septal deviation and turbinate reduction is performed through incisions inside the nose. What is the success rate of headache surgery? Studies have shown that 83 to 92 percent of patients undergoing surgery to treat nerve compression headache experience significant improvement in their symptoms. Significant improvement was defined as at least 50 percent reduction in the intensity, duration and frequency of headaches. This improvement in symptoms was shown to be still present at five years from surgery in 88 percent of patients. Complete elimination of headaches is reported in 29 to 57 percent of patients, depending on the site of compression and nature of surgery. To qualify for surgery, a patient must have an established diagnosis of migraine headache by a board-certified neurologist. Not all patients with migraines are considered good candidates. A patient’s pain characteristics should be suggestive of nerve compression. The location of the pain should correspond to one of the nerve compression sites mentioned above. The frequency of headache episodes is usually more than eight per month, but it can be less on medications. Patients with nerve compression headaches usually have a lingering pain between episodes. Headaches can be accompanied by nausea and vomiting in addition to hypersensitivity to light and noise, as occurs with classic migraines. One of the most reliable signs of a nerve compression headache is the presence of tenderness over the site of nerve compression. Patients who have severe, frequent episodes of migraine headaches who do not have a good response to medications or are not tolerating their medications, and those who have disabling migraines that interfere with their personal and professional lives, should be evaluated for nerve compression. It depends on the type of insurance. Approximately 50 percent of insurance companies cover the cost of migraine surgery. Dr. Alghoul’s staff will assist you to obtain an answer from your insurance carrier. During your headache surgery consultation, Mohammed Alghoul, MD, will go over your migraine pain history in detail. You will also be asked to fill a migraine questionnaire that will help understand the nature and severity of your symptoms. If symptoms and pain location are suggestive of possible nerve compression, then an injection test is performed in the form of Botox or nerve block. Injecting Botox into the muscle surrounding the nerve will relax the muscle fibers and alleviate the compression, and therefore the pain. A nerve block, on the other hand, involves injecting a local anesthetic directly into the nerve area to anesthetize the nerve. A positive response to Botox or nerve block is usually a good indicator that nerve compression is present and that surgical decompression could be beneficial. Surgery is performed under general anesthesia. Depending on the number of sites treated, an overnight stay in the hospital may be recommended. A drain tube is placed under the scalp after decompression of the nerve on the back of the head, and is removed in a few days. Patients may experience immediate improvement in their symptoms or it may take them several weeks, depending on the trigger site. Every patient will experience some numbness at the surgery site, which resolves with time. If you’d like to schedule a consultation with Dr. Alghoul to discuss migraine surgery, please call (312) 695-3654 or contact us via email.